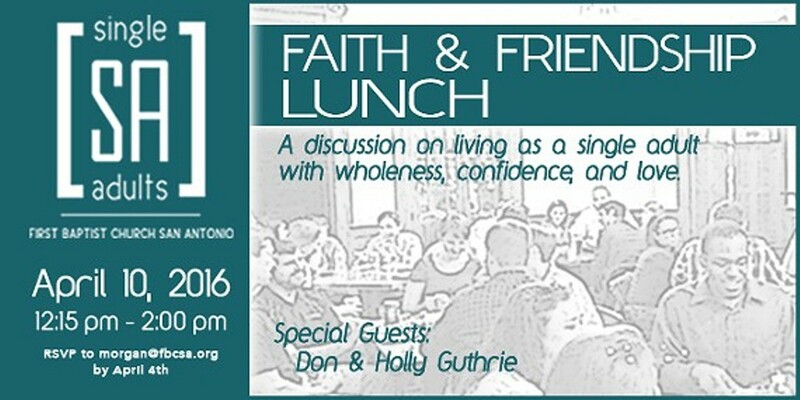 FBCSA senior pastor Don Guthrie and his wife Holly will gather with single adults for lunch--and they'll talk about what it means to live fully and joyfully in single adulthood. Don and Holly spent a significant amount of their adult lives as singles, and they are familiar with the challenges that single adults face. The idea that you can live as a whole person apart from dating, or marriage, or some kind of sexually active circumstance sounds crazy these days. So let's learn the truth again. Join us for good food and good conversation. RSVP to morgan@fbcsa.org by April 4th.